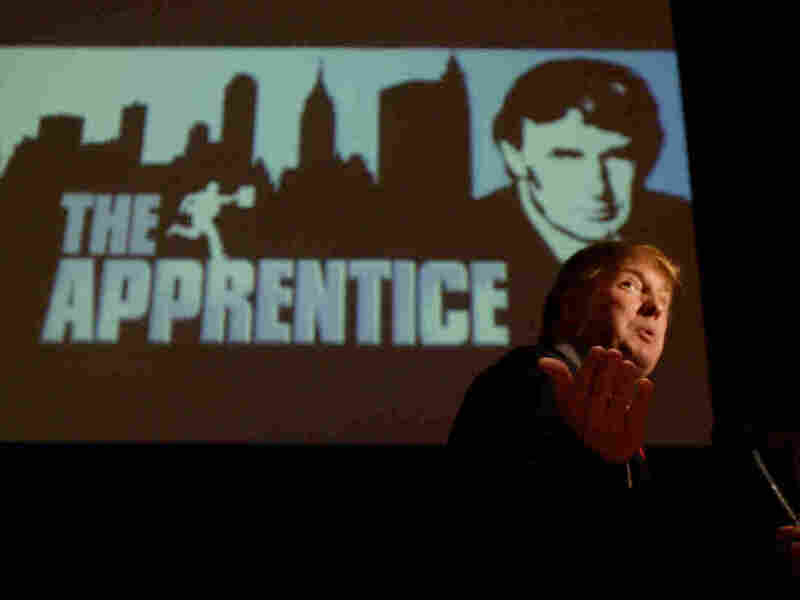 NPR's Embedded: 6 Lessons About Trump From 'The Apprentice,' Season 1 The show's 2004 debut season played a crucial role in shaping President Trump's image as a savvy businessman. But behind the scenes, one former producer says, Trump also used some "despicable words." Donald Trump, seeking contestants for The Apprentice, is interviewed at Universal Studios in Los Angeles in June 2004. The personality that made the show a hit is also what propelled Trump to the presidency. But as with his administration, Trump also stirred controversy on the set. 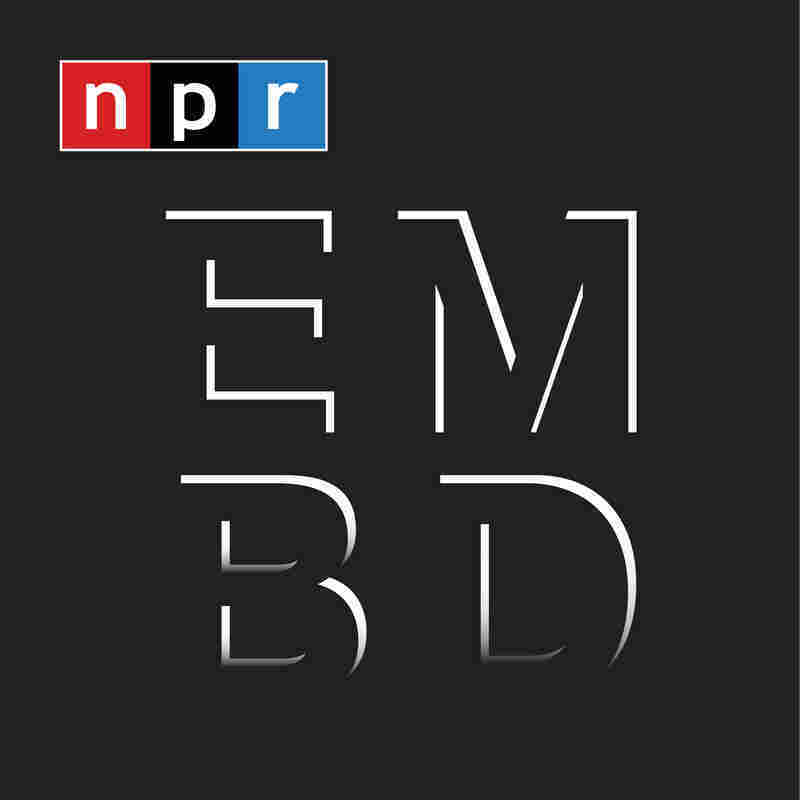 A former producer tells the NPR podcast Embedded that at times, Trump used "really unfathomably despicable words" while the cameras were rolling — remarks that have never been made public. Of course, people weren't watching then for insight into how the show's star would eventually approach the presidency or what effect it would have on his public political image. But in retrospect, there are a handful of lessons that say something about the man now in the Oval Office. Hear from the people who worked with Trump on The Apprentice, including a former producer who claims Trump made racially charged comments during filming. In October 2016, just before the election, an Access Hollywood tape emerged of Trump using crude language about women, saying, "[W]hen you're a star, they let you do it. You can do anything." When that story broke, former Apprentice producer Bill Pruitt tweeted that there were "far worse" tapes from Trump's time on that show. Pruitt says he does not have the tapes and has signed a nondisclosure agreement, but he tells NPR that the comments he was referring to were racist in nature and included remarks about African-Americans and Jews. Pruitt says that Trump's language was not a reflection of the culture of the crew and that at times, there would be an "audible gasp" from those who heard the comments. A White House spokesperson called Pruitt's story "the same recycled and false attacks from over a year ago." There have been multiple accusations of Trump publicly using inappropriate or offensive language. He started his campaign by referring to immigrants as "rapists." This summer, after a white nationalist rally ended in a death in Charlottesville, Va., Trump was widely criticized for not immediately denouncing white supremacists and instead spreading blame to people who were counterprotesting the neo-Nazis and KKK members. Those comments follow a history of ambiguity on white nationalism, as NPR's Danielle Kurtzleben has reported. The first time Trump appears in the pilot episode of The Apprentice, he is seated in the back of a black limousine, introducing himself directly to the camera. "My name's Donald Trump," he begins, "and I'm the largest real estate developer in New York." He lists off his holdings: buildings, casinos, golf courses, model agencies and much more. Then he briefly hints at his past financial challenges. "But it wasn't always so easy. About 13 years ago, I was seriously in trouble," he says, in reference to four bankruptcies involving his properties in Atlantic City and New York in 1991 and 1992. "I was billions of dollars in debt," he continues. "But I fought back and I won, big league. I used my brain. I used my negotiating skills. And I worked it all out. Now my company's bigger than it ever was — it's stronger than it ever was." In The Apprentice's entire debut season, these 20 seconds are the only substantive acknowledgement of the rocky financial history some of Trump's businesses had faced. From then on, the show consistently paints Trump as a triumphant underdog, with his troubles squarely behind him. "Donald Trump is an icon," contestant Kwame Jackson told the producers in the season finale. "He's someone who, when people said, 'You couldn't do it,' always got it done." That is a sentiment also echoed by Trump supporters during the campaign. Multiple episodes were set at Trump's Taj Mahal casino, which he described on the show as "the No. 1 hotel in Atlantic City." Flattering shots of the exterior and interior portray the resort as thriving. In fact, the Taj Mahal, along with other Trump casinos, would file for bankruptcy in late 2004, just months after The Apprentice debuted. Still, Trump's business savvy was part of his pitch during the campaign, and many who voted for him looked forward to having an outsider perspective on the inside. Despite his bankruptcies, Trump largely maintained his image of success. Every episode of the show centered on a task — a business-related contest between two teams. Who can make the most money selling lemonade on Wall Street? Managing the Times Square Planet Hollywood for a day? Fixing up and renting out an old apartment? The winning team, besides steering clear of a scolding from Trump inside his dimly lit boardroom, would receive a reward. 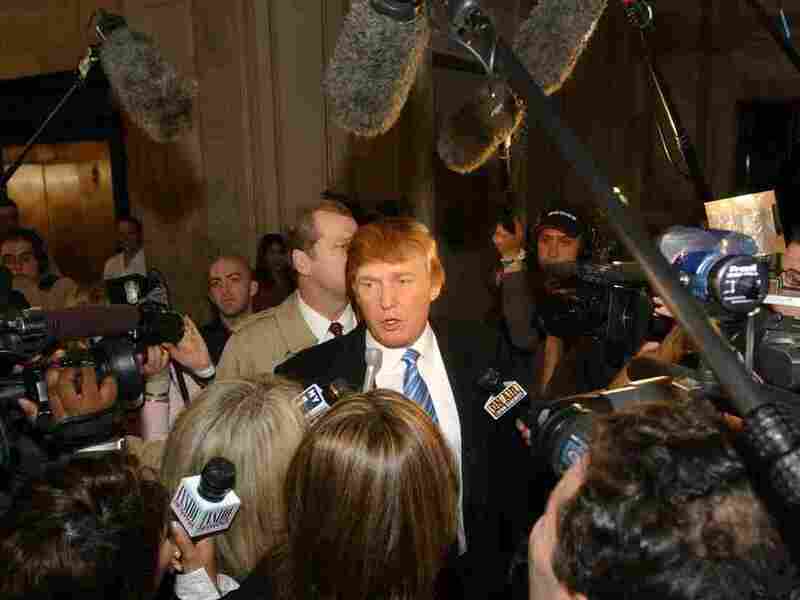 Donald Trump arrives at open auditions for second season of The Apprentice on March 18, 2004, in New York. Sometimes these rewards were simply a chance to visit classic New York landmarks: a private tour of Yankee Stadium or a boat trip around the Hudson River. But more often than not, the rewards also showcased and elevated Trump's wealth and business acumen. There was the walk-through of the extravagant penthouse in Trump Tower where Trump and then-girlfriend Melania, now wife and first lady, lived; the picnic at Trump's estate in Bedford, N.Y. ("where the richest people live," Trump narrates); the driving range at Trump National Golf Club in Briarcliff Manor, N.Y. ("the best golf course in New York state"); the overnight stay at Trump's Taj Mahal casino ("you're staying in the most beautiful suite you've ever seen"); the jaunt to Trump's Mar-a-Lago resort ("the No. 1 club anywhere as far as I'm concerned") in Palm Beach, Fla. In Episode 9, one contestant's savvy business move earns him a reward of 10 minutes with Donald Trump. "You know, a lot of people would like that opportunity," Trump tells a visibly appreciative Nick Warnock. Trump's financial ties have followed him to Washington, with watchdogs arguing for further separation from his businesses. Trump and his lawyers argue they have done enough by setting up a trust, rather than fully divesting as past presidents have done. Even amid criticism of being too close to his businesses while in office, Trump has spent many weekends at his Mar-a-Lago resort and his golf club in Bedminster, N.J. His hotel in Washington, D.C., has raised concern about whether world leaders would spend money there to curry favor with the president. And Trump hasn't shied away from talking about his properties. Even during controversial remarks about Charlottesville, Va., Trump took to the opportunity to mention his winery in the area. It didn't take the president's unearthed conversations with former FBI Director James Comey to remind the public of how highly Trump values loyalty. But the clues were also there in 2004, particularly during the firing of contestant Tammy Lee. In the seventh episode, as Trump dissects the losing team's failure as they sit before him, Lee breaks with the rest of her team to bluntly blame the team leader for having done a poor job of negotiating. Trump questions the rest of the team about Lee's dissension, asking, "Was she honest or disloyal?" The team and Trump agree Lee had not shown enough loyalty. "Your disloyalty has been just terrible. ... I mean it is so obnoxious in this particular case," Trump tells Lee as the music swells, signaling he would soon deliver his signature sentence: "Tammy ... you're fired." Comey has testified that the president asked for his "loyalty" and for him to end the FBI's investigation into former national security adviser Michael Flynn. Trump denies ever asking for a loyalty pledge, but it has been clear that Trump does expect loyalty from his team — even if he does not always reciprocate. From the start, Trump was one of the executive producers of The Apprentice (even into his presidency). And, like any good reality television producer, he appeared to have a gift for identifying and, in some cases, amplifying squabbles between contestants. Take a tense scene in the boardroom in Episode 6. Trump is interrogating the losing team, leading to the typical chain of recriminations. Controversial contestant Omarosa Manigault (now an aide to the president) begins by complimenting her teammate, Heidi Bressler, before also adding that when she first met Bressler, she didn't think she had much class. "Do you think Omarosa has class?" Trump asks Bressler, looking for a response to her teammate's backhanded compliment. He adds, "If somebody said that about me, I wouldn't like her. I don't care what they do." Trump then turns to another contestant, Jessie Conners: "Do you like Omarosa, the way she just talks to you? I mean do you like her?" Conners refuses to take the bait, instead trying to keep the peace by saying she does in fact like her teammate. But Trump isn't finished sussing out the conflict. "How can you like her, the way she's talking to you? You know she's got a very sharp edge," he says about Manigault. And on it goes. The president has had his share of direct Twitter wars since taking office, but he also has a history of publicly stoking feuds between others.
.@WhoopiGoldberg Don’t let @Rosie speak badly of you or try to bring you down. She is rude, crude & not smart. She is not in your league. During the campaign, Trump created divides to his advantage. He tried to create a chasm between Sen. Ted Cruz of Texas on one side and Sen. Marco Rubio of Florida and now-Housing and Urban Development Secretary Ben Carson. In October 2016, he reminded supporters of Sen. Bernie Sanders, I-Vt., how Hillary Clinton had wronged them, saying, "To the Bernie Sanders people, you got sold out." And last month, following a wave of kneeling protests by professional sports players, the president sought to remind the public of what he perceived to be a newly forming divide between the NFL's athletes and its fans. Trump has never struggled with being known, which made the first season of The Apprentice a huge success. Instead, his challenge has been to be seen as "favorable." The show's first season in 2004 was a game-changer for a network in trouble. NBC, which was just about to lose its blockbuster hit Friends, saw over 20 million viewers settle in each week to watch Trump preside over the fates of 16 young entrepreneurs vying for a job with his company, The Trump Organization. Attracting 28 million viewers, the April 2004 season finale was the most popular show on television that week. According to opinion polls conducted by Gallup, when Trump flirted with a presidential run under the Reform Party ticket in 1999, the percentage of respondents who saw him as "favorable" declined precipitously: from 41 percent to 33 percent in less than a month. But in 2005, one year after The Apprentice debuted, Trump clocked in at 50 percent. Trump had never before — and he would never again so far — eclipse the 50 percent mark in Gallup's polls. As of Oct. 5, nearly nine months into his presidency, Trump is at 39 percent. However, what has been a historically low approval rating for a first-term president recently stabilized. A previous version of this story misspelled Jessie Conners' last name as Connor. In addition, the rewards for the winning team included a boat trip on the Hudson River, not the Hudson Bay.